US Air Force/Senior Airman Dawn M. WeberUS Air Force F-15C Eagles, F-22 Raptors, and Romanian F-16 Fighting Falcons fly in formation over Bucharest, Romania, August 20, 2018. Now the US Air Force is upgrading its facilities along NATO’s eastern flank and testing out its capacity to set up airfields on short notice. The $US40 million in construction and upgrades over four years are meant to improve readiness by expanding what squadrons from the Air Force and partner forces can do at the 71st Air Base in northwest Romania, according to a Defence News report. Most of that money, nearly $US25 million, will be spent on infrastructure needed to support missions and flight operations, including runway improvements and hangar construction. Nearly $US10 million will go to building facilities to store weapons and fuel. Other funds will go to other improvements like paving roads around the base and repairing lights there. US Air Force/Tech. Sgt. 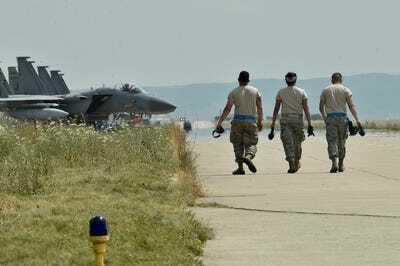 Chad WarrenThree F-15C Eagle fighter aircraft from the 159th Expeditionary Fighter Squadron taxi prior to takeoff from Campia Turzii, Romania, July 13, 2017. 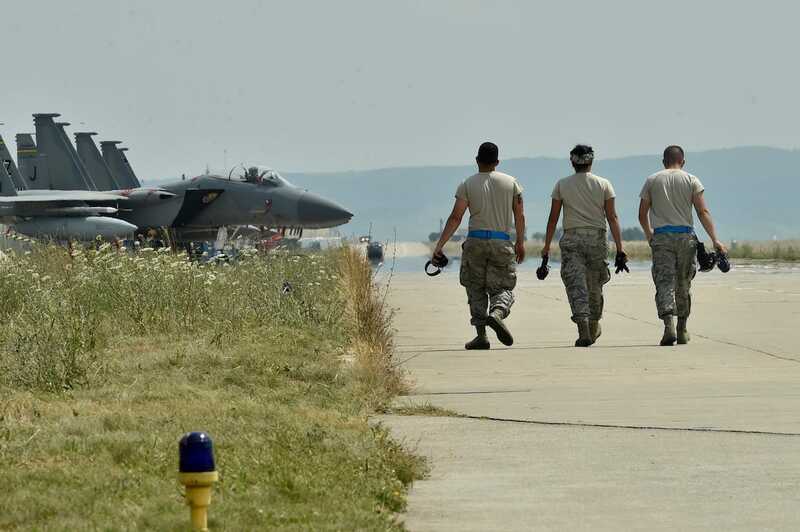 This summer, 12 F-15s and nearly 200 airmen from the 131st Expeditionary Squadron were deployed to Campia Turzii for training as part of another theatre security package. Funding for the European Deterrence Initiative, which was created after Russia’s incursion in Ukraine and originally called the European Reassurance Initiative, has spiked over the past few years. The 2019 request for EDI from the Pentagon was nearly double what it got for the program in 2017. 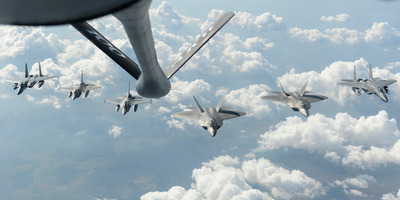 Such enhancements are “incredibly necessary to improve deterrence,” Gen. Tod Wolters, head of US Air Forces Europe and Africa, told Military.com this summer. US Air Force/Tech. Sgt. Liliana MorenoAerial porters from the 321st Contingency Response Squadron walk back to their tent at the end of day-shift during Exercise Saber Guardian 17 at Campia Turzii, Romania, July 22, 2017. In addition to $US40 million in spending at Campia Turzii between fiscal years 2015 and 2019, the Air Force will spend a little over $US31 million on infrastructure and fuel storage at Amari air base in Estonia, just under $US4 million on infrastructure upgrades at Lielvarde air base in Latvia, and $US3 million on munitions storage at Siauliai air base in Lithuania. South of the Baltics in Poland – which has been pushing hard for a permanent US military presenced and offering to pay for it – the Air Force plans to spend $US4.1 million on an operations facility at Powidz air base and more than $US14 million to upgrade the airfield at Lask air base. The Malacky-Kuchyna air base in Slovakia will see more than $US80 million in spending, most of it funding work on munitions storage. 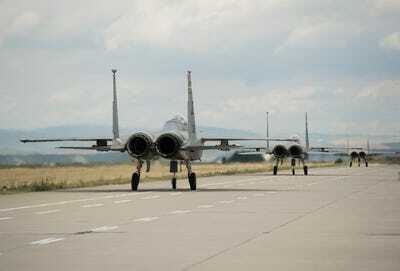 Sliac air base, also in Slovakia, will see $US22 million in spending on airfield upgrades. The Air Force also plans spend just over $US55 million on runway construction, airfield upgrades, and fuel storage at Kecskemet air base in Hungary and more than $US12 million to build facilities, upgrade runways, and add munitions storage at Graf Ignatievo air base in Bulgaria. Those upgrades will allow those bases to host more operations and to be more livable to the personnel stationed there – both from the US and the host country. But in the event of conflict the resources needed to run those bases – assuming they are still intact– will be stretched thin. DABS, contained in a set of standard shipping containers, has everything an Air Force unit would need to set up shop at another country’s airfield and begin operating, including temporary buildings, vehicles, construction gear to repair runways, and electrical equipment. DABS is much cheaper than building a new, permanent air base, but the system and the storage needed for it still costs hundreds of millions of dollars – the Air Force plans to spend $US361 million on DABS gear in fiscal year 2019. “When we deploy forward, we have very generous hosts, but in a crisis, they’re going to need their capabilities for their priorities, their mission sets, and we’re going to fight jointly and operate jointly,” Brig. Gen. Roy Agustin, director of logistics, engineering, and force protection, for US Air Forces Europe, told Defence News during a trial run of the system at a base in Poland. “Rather than add a burden by adding our [requirements] – ‘Hey, can you provide us power, can you provide us lodging?’ – if we can bring that organic capability with us, we are both more capable and there’s more synergy as a result,” Agustin said.